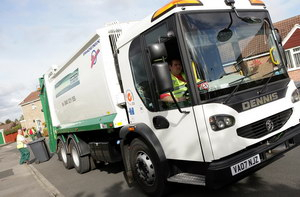 Hambleton and Richmondshire District Councils have awarded the contract to provide waste and recycling vehicles to Specialist Fleet Services. It is the first time they have worked together to procure refuse trucks. “This is the first time that we have jointly procured vehicles and there have been lots of positives from combining the expertise from both authorities,” said Director of Hambleton District Council, Mick Jewitt, who manages the waste and recycling service for both councils. He said that Specialist Fleet Services offered the best value not just in terms of price but also in terms of the overall package - fleet management, maintenance, on site engineers and a single contact point for problems. “Not having to worry about vehicle availability frees us to focus on delivering the best possible service to our residents,” he added. The 3+1+1 year contract is made up of 15 RCV’s - 10x Dennis Elite 2 6x4 standard width Olympus body with OmniDEL Xtra bin lifts for Hambleton and 5x Dennis Elite 2 6x2 narrow mid-lift Olympus body with OmniDEL standard bin lifts. This is not the first time that SFS has worked with both districts – it was awarded a contract with Richmondshire in 2004 and with Hambleton in 2007. To date SFS has supplied approximately 40 vehicles across both authorities.